Dermatitis herpetiformis (DH), also known as Duhring-Brocq dermatitis, is an autoimmune, chronic subepidermal blistering disorder characterized by an intensely pruritic, papulovesicular eruption. It is linked to gluten sensitivity and considered to be a cutaneous manifestation of celiac disease. It has been demonstrated that sera from most patients with DH demonstrate autoantibodies against epidermal transglutaminase (eTG) and tissue transglutaminase (tTG). Therefore, the aim of the study was to evaluate the diagnostic utility of eTG and tTG immunohistochemistry in identifying patients with DH. 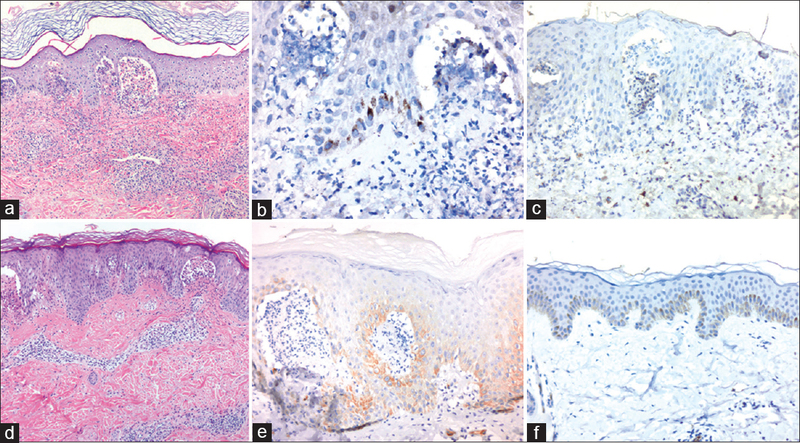 A total of 15 skin biopsies from patients with an established diagnosis of DH confirmed by histopathology and direct immunofluorescence (DIF) studies were evaluated. Six cases were used as controls in which the clinical differential included DH and were found to be nondiagnostic by both histopathology and DIF evaluations. Eight (55%) of the DH cases were positive for eTG expression, while none of the controls showed any immunoreactivity (P = 0.0456). All 15 (100%) DH cases showed faint granular staining for tTG in the epidermal basal layers with similar results in all 6 (100%) control cases. Our study indicates eTG immunohistochemistry may aid in identifying patients with DH, with a diagnostic sensitivity and specificity of 55% and 100%, respectively. tTG does not appear to be a useful immunomarker in this setting. Nine different types of proteins belong to the transglutaminase (TG) family of which two are pertinent to DH, tissue TG (tTG) which is also called TG type 2 and epidermal TG (eTG) also known as TG type 3 (TG3).,, Studies have shown that while tTG is the dominant autoantigen in CD, the main target of IgA in DH is eTG. The objective of our study was to evaluate the expression of both tTG and eTG immunohistochemistry in biopsy specimens submitted from patients diagnosed with DH to assess its possible diagnostic utility. The study protocol was approved by the University of Massachusetts Medical School Institutional Review Board. A total of 15 cases were retrieved from the surgical pathology files of the University of Massachusetts Memorial Medical Center from 2000 to 2016. Inclusion criteria included both a clinical and pathologic diagnosis of DH, detected by histopathologic features on skin biopsy with a positive concurrent direct immunofluorescence (DIF) specimen which revealed the typical granular or fibrillar IgA staining within the superficial dermal papillae. Six negative cases were used as controls from patients in which a biopsy was submitted for both histopathologic evaluation and DIF studies containing a clinical differential diagnosis that included DH but were diagnosed with other inflammatory conditions based on the histologic findings and negative DIF results such as a hypersensitivity reaction or allergic contact dermatitis, among others. Immunohistochemical studies were performed on 5-μm sections of formalin-fixed, paraffin-embedded tissue. The sections were stained with anti-TG2 (tTG) monoclonal mouse antibody (CUB7402, ab2386, 1:300, Abcam, Cambridge, MA) and with anti-TG3 (eTG) polyclonal rabbit antibody (AP 1005.1, 1:1600, Immunodiagnostics). Antigen retrieval was performed with citrate (pH 6.0) and ethylenediaminetetraacetic acid (pH 8.0), respectively. Positive staining was defined as a dark-brown cytoplasmic and granular staining in the epidermal basal layer. No staining was considered negative. Sections of tissue with known positivity for the target proteins were used as positive controls. For each marker, a two-tailed Fisher's exact test was run to determine whether the results were significant. Fifteen DH cases were analyzed and are summarized in [Table 1]. The patients comprised of 12 males and 3 females and were from 16 to 64 years of age (mean: 43.5 years). A total of 8 (55%) DH cases were focally positive for eTG, while none (0%) of the controls showed any immunoreactivity [P = 0.0456, [Figure 1]a,[Figure 1]b,[Figure 1]c. Evaluation of circulating anti-tTG IgA was performed in a total of 6 of 15 patients and 3 (50%) were noted to contain antibodies. Of these 3 patients, 2 (66%) revealed focal reactivity for eTG by immunohistochemistry. Both cases, who were negative for circulating tTG IgA antibodies, were also negative for eTG immunoreactivity. Testing for antiendomysial antibodies or anti-eTG IgA was not performed. All 15 (100%) DH cases showed granular cytoplasmic staining for tTG in the epidermal basal layers with similar results in all 6 (100%) control cases [Figure 1]d,[Figure 1]e,[Figure 1]f.
DH is histologically characterized by a subepidermal blistering disease containing a neutrophilic infiltrate with papillary microabscesses and the presence of granular or fibrillary IgA deposits along the dermoepidermal junction with accentuation in the dermal papillae on DIF evaluation, which targets the TG family of proteins., Two of the nine TG proteins are pertinent to DH, which are eTG and tTG., The dominant autoantigen in DH is eTG, while the major autoantigen in CD is tTG.,,,,, There are two types of anti-eTG antibodies described, one that binds to eTG exclusively and a second that also cross-reacts with tTG, which is in part due to the 64% structural homology between the tTG and eTG molecules within its enzymatically active domains., Therefore, sera from patients with DH often demonstrate autoantibodies to both eTG and tTG. In this study, we attempted to explore the diagnostic utility of eTG and tTG immunohistochemistry in patients with DH. eTG expression revealed a sensitivity of 55% and specificity of 100% in identifying patients with DH. The variable expression of eTG is unclear. Only 2 of 3 cases in which the patient harbored anti-tTG IgA antibodies were positive by immunohistochemistry for eTG. These varying results in relationship to the presence of antibody levels and disease activity may be due to the fluctuating persistence of IgA and eTG deposits in the skin. Unfortunately, serum antiendomysial antibodies and anti-eTG IgA levels were not evaluated and would be a better correlate in patients with DH and are a pitfall of this study. On the other hand, Sakly et al. found less expression of tTG within enterocytes in CD patients when compared to the control group but higher expression within the lamina propria. Tuncer and colleagues failed to demonstrate an increase in epithelial distribution of tTG by immunohistochemistry and showed similar expression among the patients with CD and the control group with equal distribution within the muscularis mucosa and pericryptal fibroblasts. Similarly, all of the DH and control cases in our study showed reactivity for tTG, mainly localized to the basal keratinocytes. This correlates with previous studies that have demonstrated expression of tTG in other inflammatory conditions such as lichen planus and psoriasis as well as in normal skin., These findings overall suggest that tTG is nonspecific and do not appear to be useful in this setting. In summary, based up our findings, eTG appears to be a specific marker in identifying patients with DH, albeit with a low sensitivity. tTG seems to be expressed in normal skin and in reactive and inflammatory conditions and does not appear to be a helpful immunohistochemical marker in this setting. 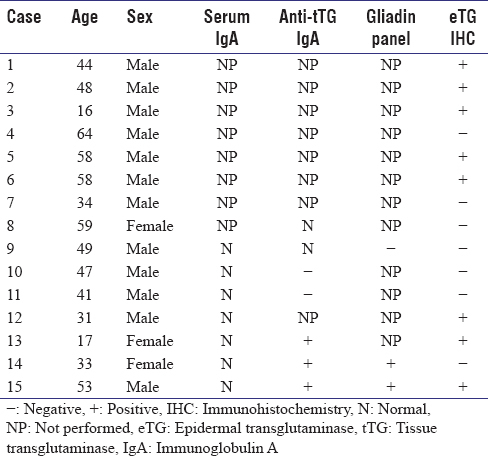 Due to the small cohort, additional studies analyzing eTG immunohistochemistry in conjunction with serum antiendomysial and/or anti-IgA eTG levels are warranted. Clarindo MV, Possebon AT, Soligo EM, Uyeda H, Ruaro RT, Empinotti JC, et al. Dermatitis herpetiformis: Pathophysiology, clinical presentation, diagnosis and treatment. An Bras Dermatol 2014;89:865-75. Bonciani D, Verdelli A, Bonciolini V, D'Errico A, Antiga E, Fabbri P, et al. Dermatitis herpetiformis: From the genetics to the development of skin lesions. Clin Dev Immunol 2012;2012:239691. Reunala T, Salmi TT, Hervonen K. Dermatitis herpetiformis: Pathognomonic transglutaminase IgA deposits in the skin and excellent prognosis on a gluten-free diet. Acta Derm Venereol 2015;95:917-22. Kárpáti S. Dermatitis herpetiformis. Clin Dermatol 2012;30:56-9. Sárdy M, Kárpáti S, Merkl B, Paulsson M, Smyth N. Epidermal transglutaminase (TGase 3) is the autoantigen of dermatitis herpetiformis. J Exp Med 2002;195:747-57. Barnadas MA. Dermatitis herpetiformis: A review of direct immunofluorescence findings. Am J Dermatopathol 2016;38:283-8. Görög A, Németh K, Kolev K, Zone JJ, Mayer B, Silló P, et al. Circulating transglutaminase 3-immunoglobulin A immune complexes in dermatitis herpetiformis. J Invest Dermatol 2016;136:1729-31. Hietikko M, Hervonen K, Salmi T, Ilus T, Zone JJ, Kaukinen K, et al. Disappearance of epidermal transglutaminase and IgA deposits from the papillary dermis of patients with dermatitis herpetiformis after a long-term gluten-free diet. Br J Dermatol 2018;178:e198-201. Cozzani E, Pappalardo F, Gasparini G, Gallo F, Drago F, Parodi A, et al. Are antiepidermal transglutaminase antibodies titre correlated with dermatitis herpetiformis lesions during the disease follow-up? G Ital Dermatol Venereol 2018;153:609-12. Eckert RL, Sturniolo MT, Broome AM, Ruse M, Rorke EA. Transglutaminase function in epidermis. J Invest Dermatol 2005;124:481-92. Reunala T, Helin H, Pasternack A, Linder E, Kalimo K. Renal involvement and circulating immune complexes in dermatitis herpetiformis. J Am Acad Dermatol 1983;9:219-23. Helin H, Mustonen J, Reunala T, Pasternack A. IgA nephropathy associated with celiac disease and dermatitis herpetiformis. Arch Pathol Lab Med 1983;107:324-7. Preisz K, Sárdy M, Horváth A, Kárpáti S. Immunoglobulin, complement and epidermal transglutaminase deposition in the cutaneous vessels in dermatitis herpetiformis. J Eur Acad Dermatol Venereol 2005;19:74-9. Donaldson MR, Zone JJ, Schmidt LA, Taylor TB, Neuhausen SL, Hull CM, et al. Epidermal transglutaminase deposits in perilesional and uninvolved skin in patients with dermatitis herpetiformis. J Invest Dermatol 2007;127:1268-71. Zone JJ, Schmidt LA, Taylor TB, Hull CM, Sotiriou MC, Jaskowski TD, et al. Dermatitis herpetiformis sera or goat anti-transglutaminase-3 transferred to human skin-grafted mice mimics dermatitis herpetiformis immunopathology. J Immunol 2011;186:4474-80. Biagi F, Campanella J, Laforenza U, Gastaldi G, Tritto S, Grazioli M, et al. Transglutaminase 2 in the enterocytes is coeliac specific and gluten dependent. Dig Liver Dis 2006;38:652-8. Gorgun J, Portyanko A, Marakhouski Y, Cherstvoy E. Tissue transglutaminase expression in celiac mucosa: An immunohistochemical study. Virchows Arch 2009;455:363-73. Villanacci V, Not T, Sblattero D, Gaiotto T, Chirdo F, Galletti A, et al. Mucosal tissue transglutaminase expression in celiac disease. J Cell Mol Med 2009;13:334-40. Almarzooqi S, Houston RH, Prasad V. Utility of tissue transglutaminase immunohistochemistry in pediatric duodenal biopsies: Patterns of expression and role in celiac disease – A clinicopathologic review. Patholog Res Int 2013;2013:602985. Tuncer I, Bayram I, Kaba I, Mercan R, Uğraş S. Tissue transglutaminase expression in duodenal mucosa of patients with celiac disease and of normal subjects. Turk J Gastroenterol 2003;14:185-8. Sakly W, Sriha B, Ghedira I, Bienvenu F, Ayadi A, Sfar MT, et al. Localization of tissue transglutaminase and N (epsilon)-(gamma) -glutamyl lysine in duodenal cucosa during the development of mucosal atrophy in coeliac disease. Virchows Arch 2005;446:613-8. Su CC, Su TR, Lai JC, Tsay GJ, Lin HK. Elevated transglutaminase-2 expression in the epidermis of psoriatic skin and its role in the skin lesion development. J Dermatol 2017;44:699-702. Bianchi L, Farrace MG, Nini G, Piacentini M. Abnormal bcl-2 and “tissue” transglutaminase expression in psoriatic skin. J Invest Dermatol 1994;103:829-33.